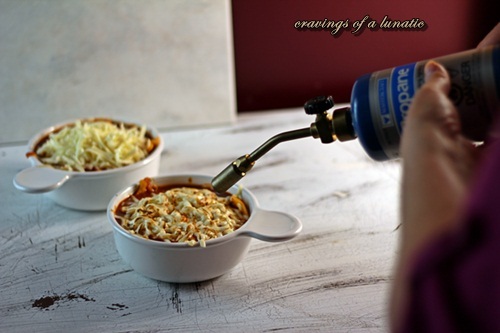 A girl, a crock pot and a blow torch! 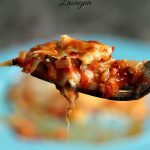 This is great recipe to make lasagna soup in the slow cooker. Then torch the top of it to melt the cheese. And yes I actually did use a blow torch. Cuz I’m cool like that. And a little crazy like that! 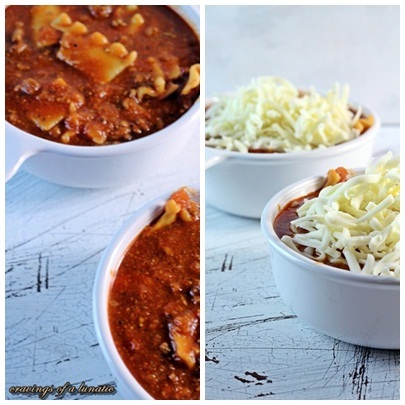 I did a “normal” version of Lasagna Soup not long ago. 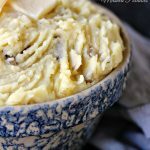 It was adapted from a Paula Deen recipe. It was so freaking good I just had to try it again. This time I wanted to make it in the slow cooker. I know so many moms are busy and like using them during the week when they work. So it’s a pretty similar recipe, just spiced up a bit and cooked a different way. As all good recipes are. Lunie: Um, not quite. We have a blow torch right. Like a big one? Hubs: You have that little one. Lunie: Ya I know, I want the big one. Hubs: Ya, we have one. Lunie: Can I have it? Hubs: What are you doing with it? Hubs: K I’ll bring it inside in a minute. A few minutes later hubs walks in with the blow torch. Hubs: So what are you doing with it? Lunie: Um, nothing. I might need you take pictures though. And he hands me the blow torch like this is totally normal in our world. Sadly, this is pretty par for the course around here. I get crazy ideas and after being charged as an accomplice enough times he’s learned it’s better not to ask questions. That way the word “premeditated” doesn’t get tossed around later. Now that’s true love. Handing your wife a blow torch while she hands you a camera, no questions asked. Take notes youngsters, this is the key to a long, twisted marriage. It’s the stuff of legends, I tell ya. One day they’ll make a movie about us. I fear for the genre we’ll be in but you know, beggars can’t be choosers and all that jazz. 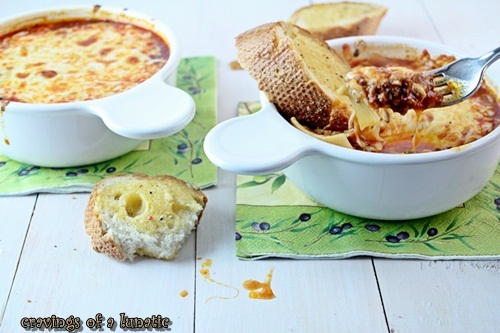 This is great recipe to make lasagna soup in the slow cooker. Then torch the top of it to melt the cheese. Brown your ground beef and onions in a pan. Transfer this to your slow cooker. Add the green pepper, garlic, sugar, broth, tomatoes, pasta sauce, spices and salt. Mix it all up and turn the slow cooker on low. Cook for about 4 to 5 hours. Stir it occasionally if you're around to do that. Toss in your parmesan cheese and stir. Option 1 is to just toss the noodles into the slow cooker. If you do it this way it will take about an hour for them to soften. They will also be a bit starchy and not quite the same taste as cooking them in plain water. This is a personal decision. I've done mine this way and to be totally honest it's easy but I like the taste of cooking them in water separately better. If you do it this way you will need to add an EXTRA 2 CUPS OF WATER OR BROTH because the noodles will soak up a ton of moisture. So add the 2 cups when you add the parmesan. Option 2 is to cook the noodles in water in a pot on the stove. This is my preference when I have time. I like the texture and taste better of the noodles when done this way. 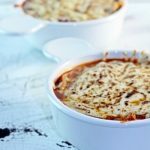 Now use a ladle and pour the soup into french onion dishes or small ramekins. 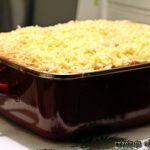 Top with a ton of cheese. Carefully start your blow torch. Go nuts on the cheese till it bubbles up and you can't wait another minute to dive head first into the bowl. Then you know it's done. For those "boring" folks who are slipping this in the microwave just cook long enough for the cheese to melt. 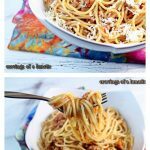 About 3 to 5 minutes depending on how many bowls you are cooking up at once. For those "boring" folks who are slipping this in the toaster oven just cook long enough for the cheese to melt. I'd say about 5 to 8 minutes depending on how many bowls you pop in and how big they are. Serve with a big old "I love adventure" smile! Unless you used the microwave or toaster oven. There's no hope for you folks. For those less adventurous types you can just pop the dish in microwave to melt the cheese. This will label you “boring” for all eternity and you’ll have to live with the knowledge you could have walked on the edge but were too chicken to try. Also for all you “boring” folks out there the cheese can also be melted in the toaster oven. Gawd, you are boring me to tears right now. I can’t even look at you. Enjoy and please feel free to send me photos of you torching your soup. I’d be happy to post them on the blog. Just remember to wear safety goggles and have a fire extinguisher handy at all time. I keep one strapped to my leg. Cuz you just never know when you’re going to need it. 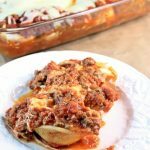 For those “boring” folks who just want to know how to make the quick and easy non slow cooker version just click on the photo below and it will lead you to my “boring” recipe. Honestly people, live on the edge a little. OMGaaah DUDE!!! You totally blow my mind away with your insanely awesome ideas! I want to jump into that crazy awesome brain of yours…. just as soon as I’m done swimming in a bowl of this soup! I find your torching sort of hot. 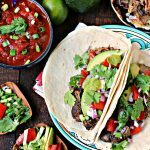 I just got a torch– yes, the small kitchen kind but still a torch– and this is a great way to use it! Great recipe. Ahahahaaa that convo cracked me up. Lol, that cracked me up. I actually tried the brulee one and it stinks for melting mozzarella cheese. Would take forever. Plus it was fun to be a badass. I’m intimidated by your blow torch. Mine is so dainty and feminine! LOL! 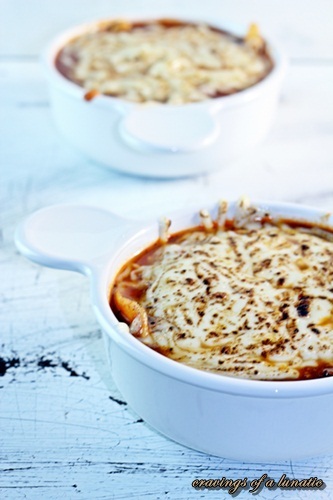 This soup looks lovely and the cheese? Just perfect. You’ll survive without the pepsi and caffeine…shortly after the twitching and cold sweats. I keep seeing this soup on the interwebz and I just can’t understand why I haven’t made it yet! It looks so good! And cheeeeeeeeessseeeee. i loved this post so much! and that soup! and the fact you used a blowtorch! i have yet to use one, but now i am dying to try! My husband and I had a similar conversation just last week when I needed to light rum in a banana sauce. I said, “You want to light or take the photos?” Bless him, the man did not flinch and took the matches. Your soup looks wonderful. I’m going to give it a try as soon as my blowtorch and crock pot arrive in the shipment. Hope your colonoscopy goes well. Are you allowed to take an Excedrin to head off the caffeine withdrawal headaches? Sending good thoughts that the cleanout is relatively discomfort free. Take care. I have a largish kitchen torch but you totally rocked with the big one. I had to laugh though at the “Big” blow torch. Praying for you, while you have your colonoscopy. (I hate those things!). Honey, you MUST know that Carbonated drinks are one of the worst things for IBS. This… THIS is brilliant! Wow! Holy sh*t!!! LOVE this!! 🙂 And loved that you just whipped out your blow torch for this! 🙂 + the lasagna looks really good too! The soup, part 2, looks amazing. I too wish you well in that most degrading of procedures. Strange things go on in marriages.. ours is no exception, but we’ll keep that on the QT for the moment. A blow torch is a wonderful thing, big or small it works wonders in the kitchen and is good for lighting the occasional cigar after a tough day’s shoot. 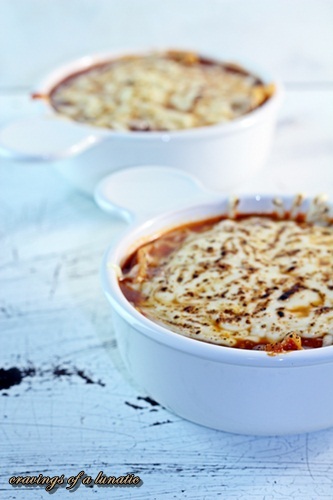 Lasagna soup is a new one on us, but it looks yummy! Hopefully by now your intervention is all over and you have eaten something. I love the image of you with the fire extinguisher tied to your leg. Actually we have one of those blow torches in the garage and I had never thought of using it like that. Great idea! Gosh, I thought I had commented on this, but obviously I didn’t. Anyway, any recipe with a blow torch gets my interest! I love playing with fire. Good stuff – thanks. I like the sound of that, haha!